Well readers, that’s the end of May! And what an eventful month it was! We found out how to overcome our election apathy, got to see some cool Kinder Egg toys, and even saw an attempt to popularise clowns! You don’t get that in every blog! And we also got to meet some great crafters and designers along the way - My Lucky Pal, Crazy Go Lucky, and the Little Monsters to name but a few. And, of course, there was our monthly puzzle. 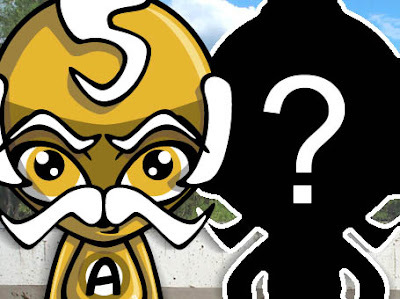 Did you work out who the Awestruck Mascot was dressed up as? Amazing! He was dressed up as the Senior Mascot! I was sure he was going to dress up as me! Well, he is called the Awestruck Mascot after all! And they don’t get more awe inspiring than me, do they? Anyway folks, be sure to come back next month for plenty more kawaii kicks. And, with the World Cup just around the corner, we’ll probably be crowbarring in some football goodies too! What? We’ve got to get readers somehow! Ta da! 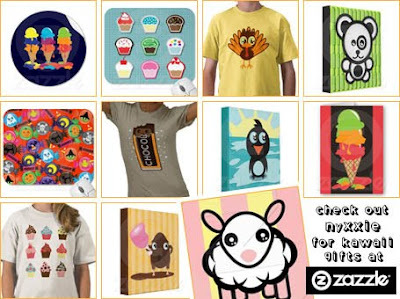 This, my fellow fans of cute, is just a sample of what’s awaiting you at the fantastic Zazzle store - Designs by Nyxxie! And when I say just a sample, I mean just a sample! Because this shop has got more cute characters than a convention for kittens! Pigs, penguins, elephants, pandas, and more - they’re all right there waiting for you and looking as cute they come! There’s even a Loch Ness monster too! How cool is that? Fantastic! 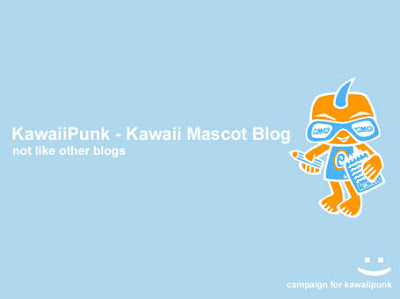 Proof again, if proof were ever needed, that the KawaiiPunk - Kawaii Mascot Blog is the number one blog of choice! Colin, I salute you! Say Hello to the Little Monsters! Fancy Dress Fun! Awestruck Mascot! Hmmm… interesting, isn’t it? It looks like our newest member, the Awestruck Mascot, has decided to attend our fancy dress party in the guise of one of his fellow mascots! And, if you ask me, I think he’s done an awesome job - ha ha! 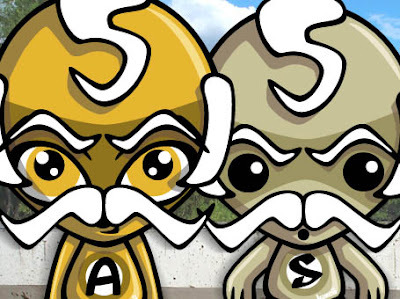 But the question is… which mascot is Awestruck supposed to be dressed up as? The answer, as ever, will be revealed in this month’s monthly round-up! Yes! 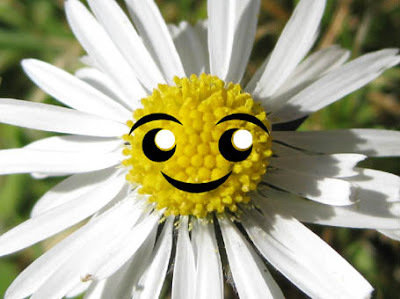 It’s a kawaiified daisy! Sweet, isn’t it? Granted, I admittedly haven’t challenged my kawaiifying prowess to its full extent by this somewhat predictable choice, but I figured it would a fitting subject to get us all in the mood for summer. I hope this email finds you in good health, and congratulations on the recent anniversary of your blog. I can’t wait to see what the next year has in store for you. Wow! Thank you your honour, it’s always a pleasure to hear from you, and ever the delight to see your amazing work! And thanks for the congratulations too! My Lucky Pal is an Etsy shop that specialises in creating cute and lovable characters to bring a bit of sunshine and luck into everybody’s lives. And we could all do with a bit of that, right? 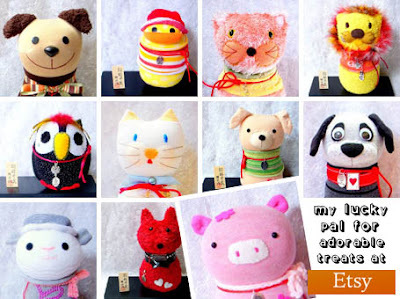 So whether you’re looking for a lucky cat, dog, pig, owl, duck, fox, mouse, sheep, koala, or even a lion, then the My Lucky Pal shop has a friend for you! How lucky is that? 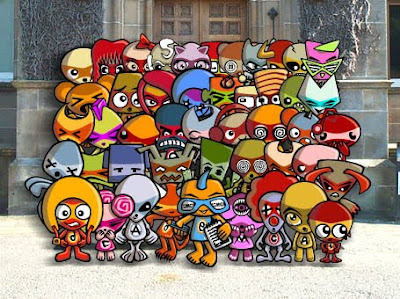 It’s a photograph of the entire KawaiiPunk team of mascots to date! And what a team they are! Incredible! Who can forget all the wonderful and insightful contributions they’ve made to this incredible blog! Like the time that… uh… em… ah… well let’s not dwell on the past, shall we? Let’s celebrate the moment and look to the future! After all, surely it can only go uphill from here! Right? One! Two! Three! HAPPY BIRTHDAY! 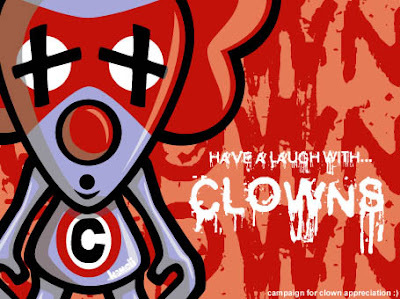 It’s a campaign poster to popularise clowns I designed to satiate my electioneering appetite! Never one to shy away from a challenge, I decided to choose clowns because nobody really likes them. No offence! And chose to use a picture of yourself because I find you really quite creepy looking. Again, no offence! Anyway, I’d love to hear your thoughts on it and, who knows, if it’s successful, I might even have a go at making another poster for lost causes! Pretty cool, isn’t it? 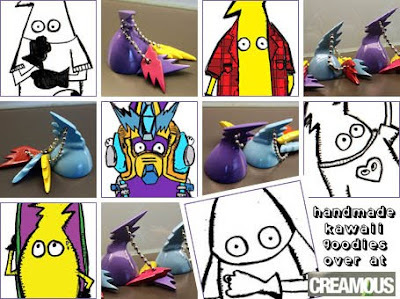 The Creamous Accessories Vol#2 are out now and are the perfect gift for any crafty connoisseur or kawaii collector. Not to mention an ideal accompaniment for anyone who managed to pick themselves up a Creamous Little figure! But get in quick folks, because I’ve a feeling that these goodies are going to be very popular! Kawaii Toys and Kinder Eggs! Being the tiniest of all the mascots here at KawaiiPunk, it will probably come as no surprise to you to learn that I’m a big fan of all things small and perfectly formed. And yes, I am aware of the irony of the word “big” in that sentence, thank you very much! Anyway, as a fan of all things petite I thought for today’s post I’d share with you a very special collection of tiny treasures. But can you guess where I got them? Well, did you get it? That’s right - congratulations to all those that said Kinder Eggs! Although to be fair, there was a pretty big clue in the title! 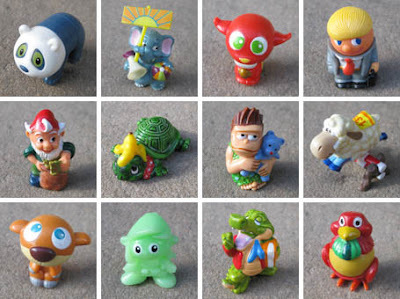 Anyway, these little beauties are just some of my collection of Kinder toys, and what a collection they are! I particularly like the Boris Johnson figure in the top right - ho ho! Well worth eating all that delicious chocolate for! And very fitting for the election month too! Enjoy the show folks! Cute, Cool Clobber at Crazy Go Lucky! See what I mean? 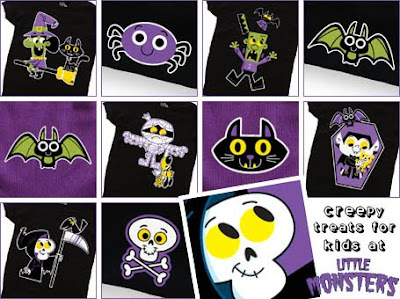 Crazy Go Lucky is a company that excels in creating cute and cool designs that effortlessly drip with style and character. And its colourful mix of kawaii and craziness has resulted in some truly stylish clothing and accessories. 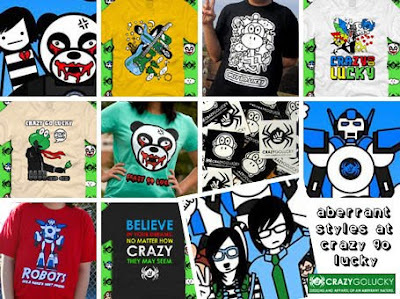 From Panda Assassin t-shirts to Monkey Mayhem stickers, Crazy Go Lucky really is a one stop shop for all things cool and stylish! And who doesn’t want that? As you’re an avid fan of fun and frivolity I thought you might be able to help with a problem I’m having - it’s called the General Election! Now, don’t get me wrong, I know it’s a very important event for grown-ups and all, but as a 12 year old kid there really is jack squat for me to get excited about! Well, I can’t even vote, can I? Normally I manage to bypass these bore-fests unscathed, but this year, thanks to whatever idiot that thought televised Prime Ministerial Debates would be a good idea, my “oh so modern” parents have been making me watch the whole ghastly affair in the name of “education” or some such nonsense! I mean really! They’re even planning on making me watch the entire election night coverage on TV tomorrow! Talk about the last straw! Don’t they know that some of us have to get up for school in the morning! Anyway, any suggestions to help me get through tomorrow night in one piece would be greatly appreciated. P.S. As well as being to young to vote, I’m also too young to drink and gamble, so I’m afraid you’ve really got your work cut out for you on this one! This, my fun loving friends, is the wonderful and whimsical work of crafter, artist, and designer Jelene Morris. Cool, isn’t it? 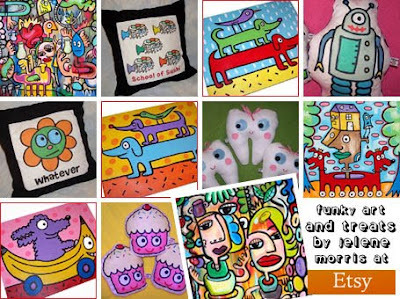 From paintings and prints to plushies and pillows, Jelene’s creations are gloriously awash with… yes, you’ve guessed it… fun, fun, fun! And, despite what some people may say, we all know you can never have too much of that :) Enjoy! Great news! A recent bout of tedium and repetition will come to an end this month! And hopefully we won’t see any more electioneering for another four years! Recycling is a great way to preserve the world’s resources! Making a soup from bathwater isn’t! Remember this distinction when trying to impress that new ager! The phrase “have a nice day” is merely an expression of social pleasantry, not a contractually binding agreement! So don’t feel too bad when it all goes wrong! A question from a stranger has the potential to cause you great embarrassment this month. Just remember - you don’t have to tell the pollsters how you voted! Jumping up and down and screaming isn’t always the best way to get what you want! And besides, it makes you look ridiculous! What? I’m just saying! A business lunch at a posh restaurant could go disastrously wrong for you! Learn to speak French right now, just to be on the safe side! Avoid adages, sayings, and proverbs if you want to survive this month unscathed! And remember… a bird in the hand is worth two in the bush! Woops! An unshakable and unsettling sense of deja vu will relentlessly haunt your every move this month. Or was it last month? An impulsive buy has the potential to leave you embarrassed and out of pocket in the coming weeks! Remember - magic beans only exist in fairy tales! Learning from your mistakes is the best way to accumulate knowledge. And by the end of this month, you’re going to be very knowledgeable indeed! Sorry! A malfunctioning belt could spell your downfall this month, in more ways than one! Now’s a good time to buy some dungarees! A horoscope prediction will change your life for the better in unimaginable ways this month! Although, ironically, I’ve no idea how!